The book’s clear organization provides easy access to information with straightforward directions and hundreds of full-color photos. You’ll also find easy projects for trying the techniques, as well as a stunning gallery of metal jewelry pieces by experienced designers. 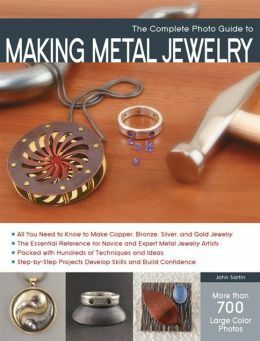 Find beautiful jewelry examples and gain skills and inspiration with The Complete Photo Guide to Making Metal Jewelry! John Sartin designs stunning, unique handmade jewelry in gold, silver, copper, brass, and precious and semi-precious gemstones. His jewelry has appeared on the cover and in the pages of Lapidary Journal, and he has also been published in Art Jewelry magazine and other Lark publications. He has won numerous awards for his designs. He lives in Albuquerque, NM. Visit him online at http://www.johnsartindesigns.com.